The Princeton Companion to Mathematics, edited by Timothy Gowers (June Barrow-Green and Imre Leader, associate editors), Princeton University Press, 2008, 1008 pp. Department of Mathematics and Statistics, University of Helsinki, Finland juliette.kennedy@helsinki.fi. 2 “The Essence of Mathematics” in Newman, J. R. (ed.) The World of Mathematics, New York: Simon and Schuster, 1956 . 4 as described by Hodges, Wilfrid in “What is a Structure Theory,” Bulletin of the London Mathematical Society, (1987), vol. 19, 209–237 . Shelah's abstract announcing the final step of the proof was called “Why am I so happy?”, Abstracts Amer. Math. Soc., 3 (1982), 282 . 12 Harris has written about 5 philosophical papers out of a total of 70. The remainder are mostly in the area of number theory. 14 p. 970. Italics the reviewer's. 16 p. 971. 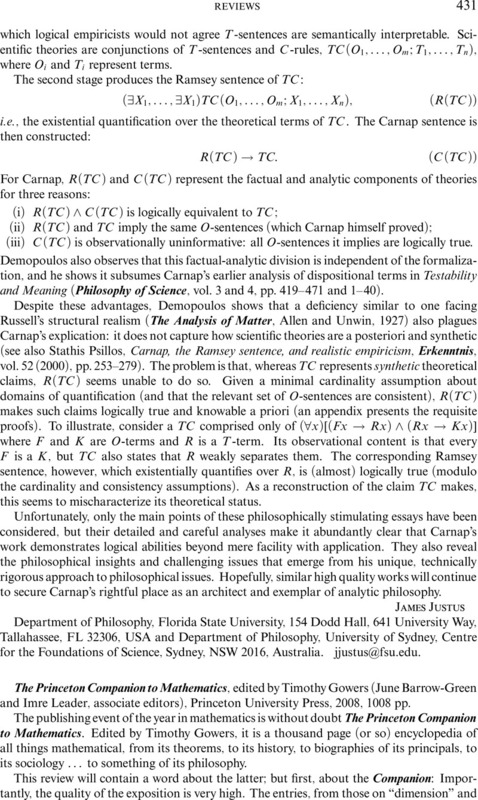 Harris is quoting from Corfield's, David Towards a Philosophy of Real Mathematics, Oxford 2003 . 17 p. 971. Harris is quoting from Hacking's, Ian Historical Ontology, Harvard, 2002 . 21 Many of the above-cited remarks, as well as those of a similar critical nature, are a somewhat disparate collection of citations from the literature. It is therefore perhaps not entirely clear what the specifics of Harris's own criticism amounts to. 22 p. 21, Theories and Things, Harvard 1981 .